Parents and their children at the Easter Egg Drop- Palooza fundraiser at an event to raise money for Lucy&apos;s Love Bus, named for Lucy Grogan of Amesbury who died of Leukemia at age 12. When Lucy’s Love Bus founder Beecher Grogan saw the crowd gathering at the Egg Drop-Palooza, she realized the event she’d been working on for months wasn’t going to go as planned. 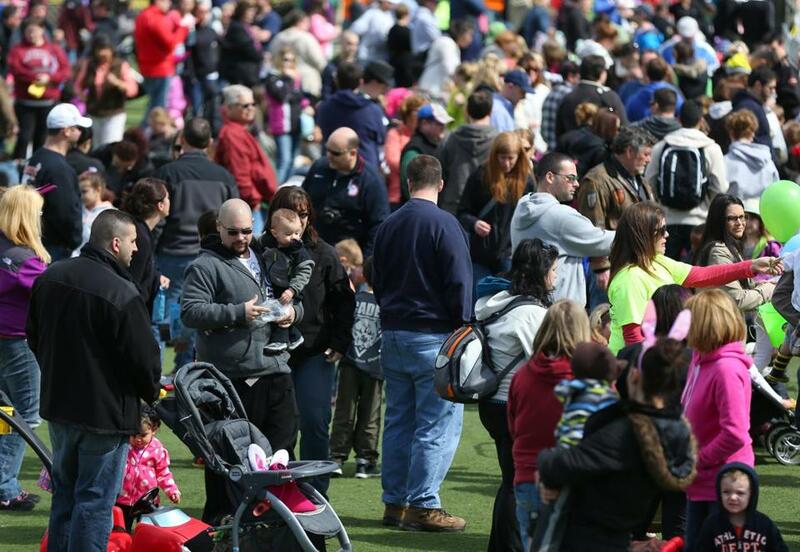 What was supposed to be a controlled, family-oriented fund-raiser capped at 5,500 attendees became a hectic free-for-all, with thousands more without tickets crowding the event at Amesbury Sports Park last Saturday. Grogan said 5,000 tickets were sold in advance for $5 each and 500 more were reserved for purchase at the gate, but those sold out quickly. She estimated that about 3,000 people came without tickets, which resulted in traffic back-ups on Interstate Route 495, parking chaos, and too few volunteers for the volume of guests wanting to get through the gates into the park. There was such a long line of angry people at the gates — some with tickets and some without — that it was becoming a safety issue, so everyone was let in to ease the tension, Grogan said. There were even a couple of calls to 911: After a helicopter dropped thousands of plastic eggs from the sky, Grogan said about 35 children were separated from their parents because of the overcrowding. Grogan said she was sad to see some children put dozens of plastic eggs in their bags while others had none. Lucy’s Love Bus was created by Grogan’s daughter Lucy, who lost a battle with acute myeloid leukemia at the age of 12 in 2006. Toward the end of her life, she made it her mission to promote soothing therapies for children with cancer. Since Lucy’s death, her mother has held fund-raisers to offer children $1,000 grants to pay for such things as massage, acupuncture, and art therapy. However, Grogan said, she received an influx of “hateful” feedback, particularly through Facebook , that accused her of welcoming the extra attendees and endangering the welfare of those already there in an attempt to raise more money. Grogan said that couldn’t be further from the truth, but she has issued many apologies through social media and e-mail. Grogan said that she looks at the experience as an opportunity to learn, and she even addressed problems during the event. When the first of two egg drops resulted in some upset, empty-handed kids, she took the microphone to remind the children that fairness is ultimately rewarded. According to Eric A. Gregoire, Amesbury Mayor Thatcher W. Kezer’s chief of staff, the city and the sports park are usually prepared to handle large groups of people, with off-site parking available when needed. Despite the problems at Egg Drop-Palooza, the event raised $30,600, well beyond Grogan’s $20,000 goal and enough to sponsor 30 children for a year. However, Grogan said that during the egg drop, she realized the nature of the activity doesn’t align with the Lucy’s Love Bus mission. Grogan said the mishaps will not stop her from holding future events, a feeling that was only solidified when Lucy’s Love Bus received a $10,000 grant from the Expect Miracles Foundation last week.